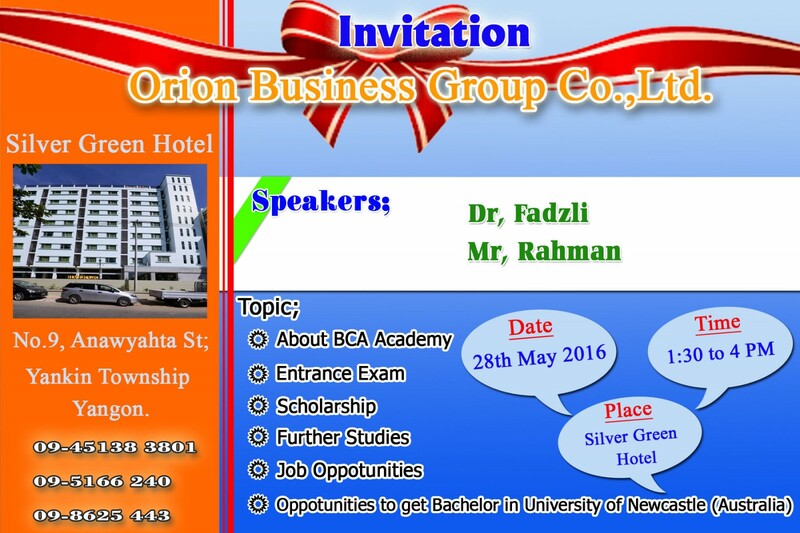 Engineering interested by students and his child Engineering good as surviving parent for Singapore Ministry BCA ACADEMY (BUILDING & CONSTRUCTION AUTHORITY) of 2016 October school opening hours in Education Seminar at Yangon, Yankin Township, 12 Road near the traffic light (Silver Green Hotel) Green Hall, in May 28th days, Afternoon (01:00)pm to (04:00)pm will be held. The Education Conference from BCA Academy teacher collaboration and from CARE FOREVER EDUCATION CENTER will be held. In addition, BCA Academy School's October 2016 entrance exams in May 29th days on Sunday (08:00) am of the first texts. CARE FOREVER EDUCATION services related to education will be free for students and parents to discuss Education are inviting you to enter discussions. Face book Chat Box can send queries.